These days it is easy to startup a company, but growing it into a successful organization is challenging. Stories of “overnight” successes are in the media everyday but dig deeper and you will find out that a whole network of people have usually been working hard for years to get things going. Thankfully many of those experienced in such growth are eager to give back and often this is through some form of mentorship to earlier staged companies. Accelerators and Incubators serve to coordinate this network of advisors and often are able to provide formal programs that include work space, investment, service discounts, and access to the curated group of mentors willing to lend a hand. Though each of these accelerator and incubator programs differs slightly many follow a similar 3-6 month timeline that culminates in a presentation or DemoDay geared towards attracting investment, customers, and press. In order to take advantage of this opportunity it is crucial that incoming companies have a clear set of goals, and a plan on which to execute in the short time provided. Keeping in mind that a 100 days is a very short amount of time it is important to be realistic about what can be accomplished. Sure a 90 day lead time from a supplier can theoretically still allow a few days for things to arrive in time for the culmination of a program, but anyone who has brought something through a full product lifecycle will tell you that banking on exact dates is a recipe for disappointment. Each company will have a different set of goals for their accelerator. For physical goods, some will have a product at market and can use the time to build relationship with distribution and sales partners. Some will have just a napkin sketch of an idea and can use the time to source and develop a supply chain. Still others may have everything ready to go and can use the time to prepare a pre-sale or crowd funding campaign especially since DemoDays can make a strong impact on the PR required to successful execute a campaign. Here though are a few things to keep in mind for any program, some good habits to get into since things will be moving very quickly. The details are different for everyone but having some plan in place prior to starting an accelerator will make a huge impact on a companies’ ability to execute. When it comes to operations the stage of the company will dictate everything. Seasoned entrepreneurs will know to keep an eye out for the housekeeping items but even they can sometimes forget things. Be sure to think through all of the forms, filings, certifications, and testing that is required to operate and sell things. Failure to register a UPC label can hold up printing of product packages. Neglecting to file the right forms in your state can also lead to costly fines come tax time. 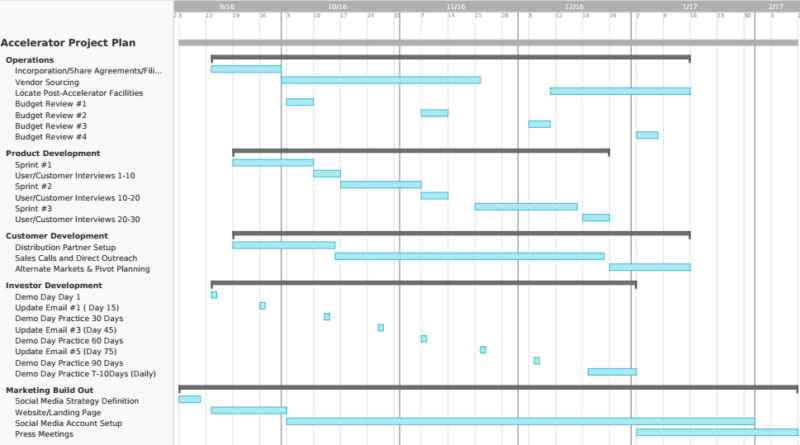 Get this stuff out of the way first, sit down sometime in the first few weeks, or ideally before the program and write out a list of everything that has to be done and when. Keep this list, or use a project management tool to track each task and avoid things falling through the cracks. The handy chart above is a great place to start. 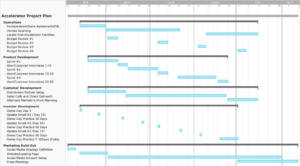 Gantt charts can be created in Excel and there are tons of simple services to help as well. The sample shown was made with TeamGantt, which offers a 30 day free trial (I get nothing from them but do like the service), and is also often available at a discount or free for those companies participating in a formal accelerator. If you want the discount ask the Accelerator or Incubator program manager to reach out. You can do this yourself too, but delegating will free up time and the accelerator may have an easier time navigating a discount given their access to numerous companies. Another piece of operations worth getting into a habit of is budgeting. When teams are small and moving quickly it’s easy to have an ad hoc approach to simple purchasing and receipt expenses. But with things moving quickly it is also easy to miss something and given that many accelerators offer funding of $20,000-$100,000, even small mistakes can be a measurable percentage of your cash. Investors, or banks, will eventually want to see formal financial statements so get into a habit now of doing checkins and updates often. Transparency can help everyone understand where money is going and setting a limit on single approver spends can avoid over paying when alternate options abound. The excitement, speed, and network surrounding the top tier accelerators is a unique atmosphere. In order to take advantage of that a company must be able to iterate and gain feedback quickly on any progress. For this reason setting up product development cycles in short chunks can be hugely beneficial. Software developers are used to seeing scrum and agile systems work in ‘Sprints’. Sprints are short duration well defined events that keep teams focused on generating a useable outcome. Though the term and research was heavily influenced by software design it is entirely possible to apply the same concept to hardware or hybrid products. Try breaking the accelerator down into equal sized parts (keeping in mind major holidays or events that may disrupt normal workflow). For the 100 Day plan this can mean 3 separate sprints each of 21 days, with an additional week in between to review and prepare for the next push. Define what a useful outcome would be of each cycle, maybe it’s a “works like” prototype or a “looks like” prototype but typically it is something that can be used to gather feedback. In between the sprints setup formal time for feedback and tweaks. Get your demo system or product into the hands of potential supply chain partners, industry mentors, or early customers and see what issues they have or features they really gravitate towards. Focusing on getting to production is a key for physical products. There is a great article posted by a Chinese based consulting firm, Titoma (a mashup of TIme-TO-MArket), on some of the major pitfalls of going from a first stage prototype into production. Keesjan Engelan, CEO of Titoma, points out that “4 out of 5 hardware campaigns that don’t manage to ship in time show that most teams still underestimate the DFM (Design For Manufacturing) process. ” An Accelerator is a great time to dig into these details and avoid long delays down the line. The shared minds of mentors, and advisors can help to highlight all of the issues and gives first time product developers a leg up over the tinkerers still in their garage. My favorite way of breaking down customer development, especially during the time of an accelerator, is to follow a simple three step process. Sure this might sound cliche but talk to any successful larger company and they will have stories of how they eked out an extra sale, landed placement in retail, or got a meeting with a key distributor by putting themselves in the right place at the right time. Often it is the case for early stage companies that growth can be acquired in a very granular fashion. If you are looking to pre-sell 1oo units of something than a good conversation at an happy hour can easily get you 2-3% of the way to your goal. It is a simple fact that most early stage accelerator companies will be seeking outside funding. That is the whole reason to accelerate things as the opportunity is now and funding via profits, especially in a hardware space, can take a long time (although for many companies it may be the best option). Get into the habit of building conversations with investors early. Closing funding can take a notoriously long time and it is super rare to hear of anyone investing after a first meeting. Establishing a regular update cycle to investor, with for example a weekly email, shows that you are moving forward regardless of them coming on board. A regular outreach also ensures you are top of mind and gives a potential investor something to respond to with more questions. If you are serious about generating investors it is worth putting some structure around the process. Consider setting up a CRM system to track interest and investment size, tools like Streak and Contactually, are great at this. There is no reason to develop elaborate 10-k like filing documents at this stage but where appropriate showing clear metrics or how the company is tracking to goals can show that you are ready for that level of scrutiny when the time comes. Accelerators, and especially those that culminate in a DemoDay, offer a great chance for early stage companies to get some press. But, even if all press is good press, some forward planning can still turn good into great. Understanding what the press can do for you is key as well. For the 100 day accelerator there may be opportunities on day 1 to get press, but if that same story can be timed to benefit your organization even better. Personal Friends/Happy Hours/Accelerator Events/Coffee Meetups – Again here if your goal is to start selling a physical product in low volume (and eventually high volume) there will be someone who physically handles it. Talk to whoever you can and find out who those people are and what problems you can solve for them. A customer interview can come from anywhere. Social Channels (Twitter, Facebook, Website, Blogs, Snapchat, LinkedIn Etc.). Not every company needs a presence on each of these channels. Consider, even for a moment, how much time it will take to upkeep and engage on each platform and make a point to develop relationship on those platforms. Press. Most accelerators can get some form of press for their class or cohort, it’s what helps them attract more great companies. Keep this in mind, work with the organizers and mentors to understand what stories they might have that are newsworthy. Remember that writers have customers too, their readers. Think through what is interesting about your company, and not just what you think is interesting, but what OTHERS think is interesting as well.